Today, Southtown is inextricably linked with Yarmouth. It has long been part of the Borough, and the warehouses off of Southtown Road face across to Yarmouth's beautiful South Quay, with its elegant town hall and grand Edwardian banks and public houses; but by one of those quirks of England's administrative history Southtown is historically part of what was the Suffolk parish of Gorleston, and was only moved into the county of Norfolk in the 1920s. Before then, it is easy to imagine the Yarmouth folk and the Southtowners facing each other across the Yare with something approaching suspicion. Southtown merges into the urban area of Gorleston, and Southtown Road was part of the London to Yarmouth road, known today as the A12, which has only bypassed Southtown in the last 20 years or so. It is hard today to imagine this place having a proud independent life of its own, and perhaps it never did have, but it is quite different in character to the southern part of Great Yarmouth and Newtown across the water. A bridge has long connected Southtown with the centre of Yarmouth, and South Town station (the two-word station name an idiosyncracy), on the line from Lowestoft and Beccles, was closer to Great Yarmouth's town centre than either of the two stations on the other side of the river. It finally closed in 1970. 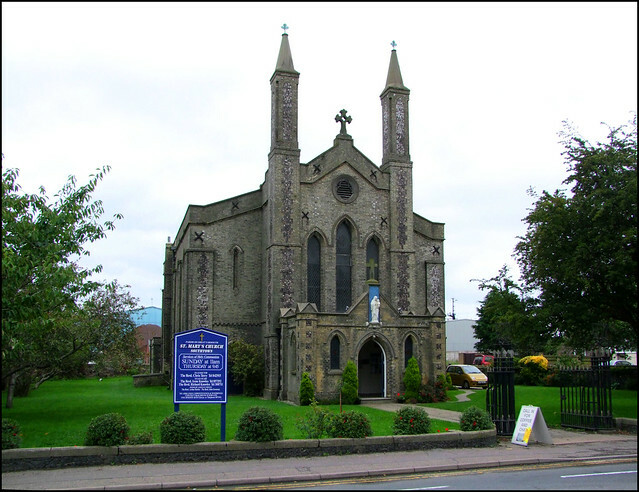 Southtown's parish church, however, is still alive, and continues to prosper. It stands on Southtown Road, the former main road from London, and must have been a familiar landmark to thousands of holidaymakers, knowing that a sight of its curious square spirelets meant that their journey was almost at an end. That the style of this church is determinedly unecclesiological has not endeared it to all visitors. Bill WIlson, writing in the revised Pevsner, calls it depressing, but this is surely unfair. St Mary is a Georgian church, a great curiosity in Norfolk, built in 1831 to the designs of Yarmouth's most prominent architect of the 19th Century, JJ Scholes. 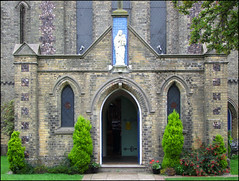 That he would 'get' the approved Gothic of the ecclesiologists later in the century is clear from his fine St Mary's Catholic church in the centre of Yarmouth, but his similarly idiosyncratic St Peter (now St Spyridon) followed hot on the heels of St Mary Southtown, and the two very different churches make an interesting comparison. Perhaps it is the yellow brick of the exterior of which Wilson did not approve. For myself, I rather like its gritty urban feel, a reminder that Southtown is no mere characterless suburb from the later decades of Queen Victoria's reign. The building was extended with vestries in the last decade of the century, and I suspect that the west porch with its vivid statue and niche was also added at that time. You step inside to an interior which, if anything, is even less ecclesiologically-correct than the exterior, for there are no arcades, no aisles, no chancel arch, just a large square space with a smaller square chancel off of it, all under ceilings. The east wall is blank, and the windows to north and south have no coloured glass. It is robustly pre-Victorian, and it is a shame that the west gallery, which would have completed the piece, was removed in the years before the First World War. Those who took it down were no doubt following the precepts of the ritualist movement, and they would be very pleased to discover that their now-beleaguered movement is still in the ascendancy at St Mary today, for this is a thorough-going Anglo-catholic church. The grand reredos and panelling came from Scholes's St Peter when that closed in the 1960s, as did the pulpit, which seems rather overlarge here. The parish WWI memorial records a jaw-dropping 95 names, and I had to look twice to make sure that it was not a roll of honour. But no, for these were the men who left all that was dear to them, endured hardness, faced danger and finally passed out of the sight of men by the path of duty and self-sacrifice, giving up their own lives so that others might live in freedom. In the porch windows there are four simple roundels to the evangelists, and by the the west doors is a memorial to the man for whom they were installed, a former organist. To the Glory of the Great Architect of the Universe, it begins, and lists his lodge memberships, a reminder of how, in the early 20th century, the Church of England and Freemasonry often went hand-in-hand, so to speak. There is a delightful font at the west end, as well-proportioned as any Georgian birdbath, but thoroughly Gothick, with faux-15th century panelling. You can't help thinking that the young Scholes put a lot of energy and enthusiasm into designing this place, and it continues to be well looked after today. I came here on the Historic Churches Bike Ride day of 2010, and one of the welcomers was a jolly Maltese lady, who told me that she came here rather than to the Catholic church in the centre of Yarmouth because it reminded her more of the churches at home, although I suspect that the friendliness of the other welcomers I met also had something to do with it.